If you're in the U.K., this one is old news to you, but for those of us across the pond, the release of Paddington 2 saves us from what is traditionally the weakest movie month of the year. Apart from the Oscar holdovers (The Post sees its wide release the weekend), January is where movies (and Liam Neeson) go to die, and it's a tough month to make it through as a critic. But when one of my childhood favorites made it into the right hands at Heday Films, a classic was born, and the follow may not be quite as good, but it's awfully close. The beloved bear has become a fully integrated member of the Brown family, even going by the name Paddington Brown. But with his beloved Aunt Lucy's 100th birthday approaching, the lovable bear wants to get her something special, and he sets his sights on a pop up book of London. Paddington performs odd jobs and saves his wages to buy the book, but when he is just a day away from having enough money, he witnesses the book being stolen from the shop by a bearded thief. the bear is accused of the crime and subsequently arrested when the true culprit flees after a brief chase. The Brown family is determined to get their furry friend's name cleared, but the hapless young bear must do his best to survive life behind bars. Naturally, everything works out fine in the end, but the fun comes in getting there. Making marmalade with Brendan Gleeson. Director Paul King approaches these films with a deft but loving hand, and a perfect understanding for the source material. King has done such an impressive job with these films that it seems inevitable that even bigger things are in store for him (his animate musical, Meet The Beatles, remains an eagerly awaited project, and he's already slated for Paddington 3, but I think he'd be a wonderful choice for an Ant Man or Spider-Man: Homecoming style action comedy.). In front of the camera, all of the major players from the original are back for part two, minus Nicole Kidman as the villain, but she's very ably replaced by Hugh Grant in a delightfully self depreciating turn as a pompous actor with a hidden agenda, and the addition of Brendan Gleeson as a hardened criminal who takes Paddington under his wing, really couldn't be more fun if it tried to be. The entire cast is clearly having a marvelous time, with Hugh Bonneville one again stealing the show with his hilarious subtle comedic touch, and Oscar nominee Sally Hawkins gets even more to do this time around. Ben Whishaw is perfecting as the voice of everyone's favorite bear. This film is fast, funny and thoroughly charming every step of the way, and you not only owe it to yourself to see it, you owe it to the industry. 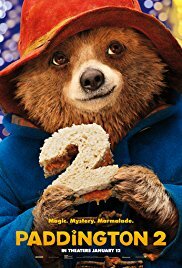 The industry that gets told over and over again that not enough decent but high quality family friendly fare gets produced needs your encouragement to make more movies like Paddington 2, and it's a bit like voting. If you don't participate, you lose the right to gripe.